Both four and six-pack fittings come in four different color variations. Nickel, Black, Red, and White are chosen as the most popular colors that are being used. The EK-ACF Fitting (Advanced Compression Fitting) multipack is a soft-tube compression fitting pack, they are designed for use with flexible soft tubings such as PVC, EPDM, Norprene, silicone or any other type of compatible flexible tube. 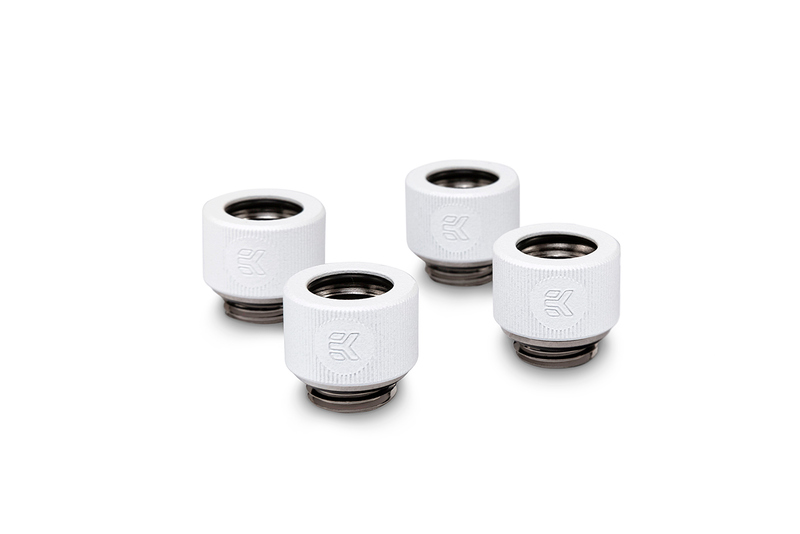 EK-ACF Fitting is a secure variant of the tubing fitting connector as the locking ring prevents flexible tube to be pulled out of the fitting by compressing the tubing wall underneath the ring. Such fitting does not require any hose clamp or similar substitute. The barb is made of nickel-plated CNC machined brass and the locking ring is made of CNC machined nickel plated brass, anodized aluminum or powder coated depending on the fitting type. These fittings feature low-profile design hence it is mandatory to secure the fitting barb using Allen Key 8mm (not included, available for separate purchase) to prevent skin damage to the fingertips since the barb has no gripping surface. 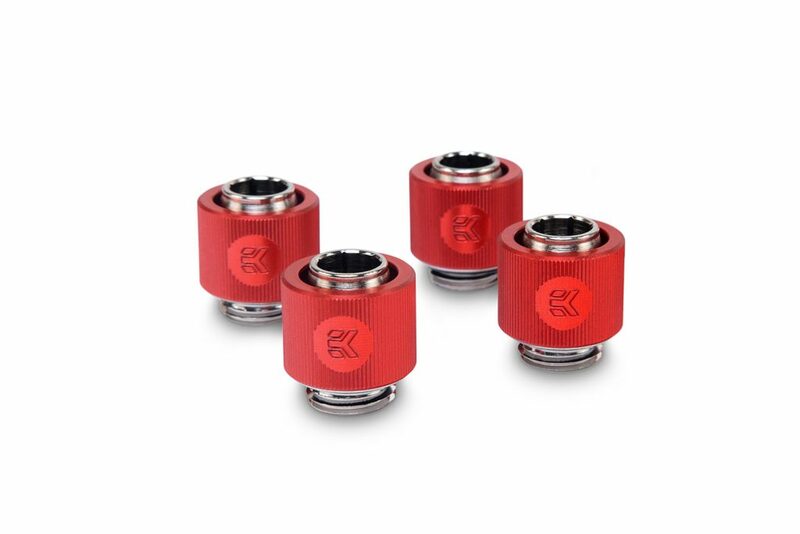 Four-piece and six-piece multipack EK-ACF Fittings are available in 10/13mm (3/8″ / 1/2″) ID/OD and 10/16mm (3/8″ / 5/8″) ID/OD variants in all four colors. The multipack EK-HDC Fitting is a hard tube compression fitting pack, they are designed for use with solid tubing such as Acrylic, PETG, Copper, Stainless Steel, Glass, Carbon Fiber or any other type of compatible hard tube. 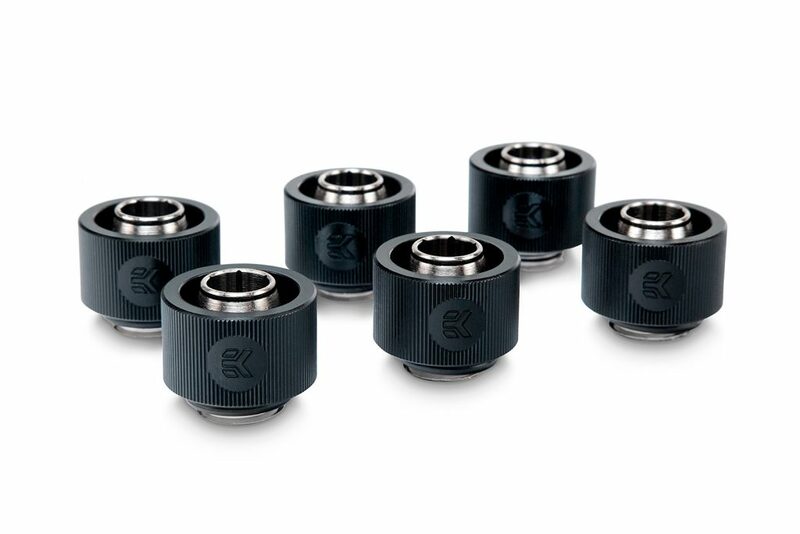 EK-HDC Fitting is a more secure variant of the EK-HD Adapter fitting as it prevents solid tube to be pulled out of the fitting by compressing the rubber gasket underneath the ring. The base of the fitting is made of nickel-plated CNC machined brass and the locking ring is made of CNC machined nickel plated brass, anodized aluminum or powder coated depending on the fitting type. For easier handling, it is recommended to secure the fitting using Allen Key 9mm (not included, available for separate purchase). 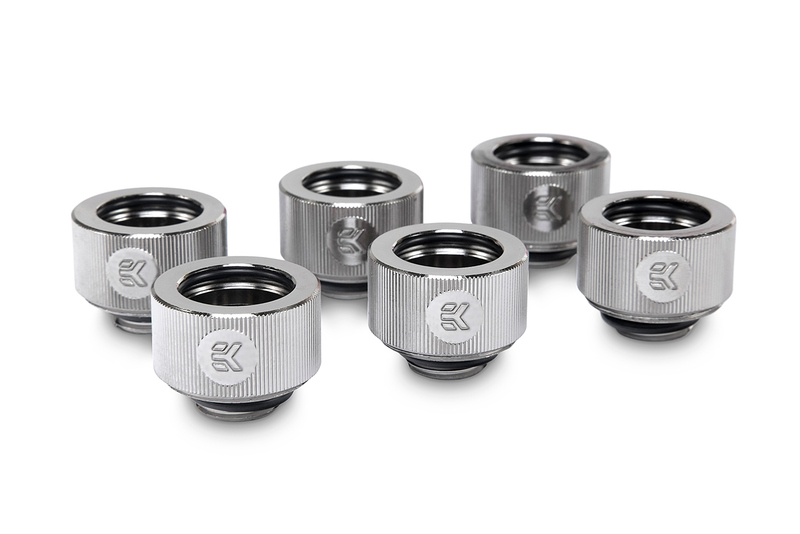 Four-piece and six-piece multipack EK-HDC Fittings are available in 12mm (7/16″) OD and 16mm (5/8″) OD variants in all four colors. New four-piece and six-piece multipack fittings are designed and engineered in Slovenia, Europe. 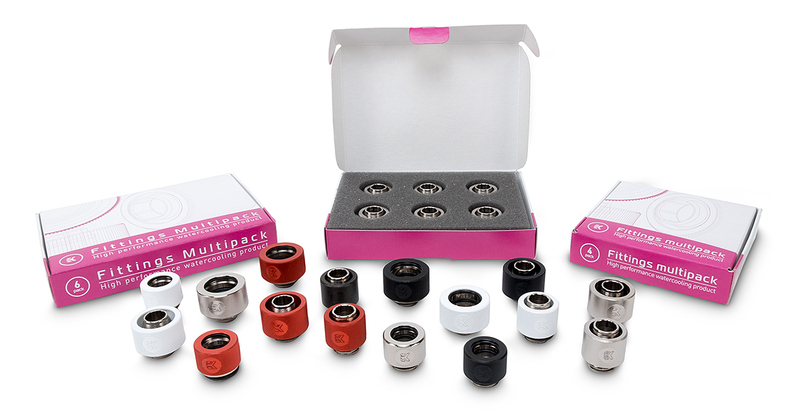 All multipack fittings are already available for purchase through EK Webshop and Partner Reseller Network. In the table below you can see manufacturer suggested retail price (MSRP) with VAT included.